Cirrus' long-awaited major growth phase has begun. We expect it to last years with massive new revenue likely. Sadly, it has begun during a period of significant softness in its existing business. Cirrus Logic's (CRUS) proprietary business model continually creates limited vision when predicting future growth. We continue our Cirrus discussions with hopefully a different approach into quantifying how much, when and with whom will be the next growth from Cirrus' creditable comings. It is clear that the next growth phase started in the March quarter and unlike former growth phases will likely last multiple years. But also unlike the company's former growth phases, this one begins with market softness. Jason Rhode, Cirrus' CEO, in the last conference, offered two comments while describing the March quarter guidance, "I would certainly assume that the softness continues carrying into Q1." Continuing in the last shareholder letter, "however, given the wide array of uncertainties... and their unknowable impact on smartphone volumes, we are not currently providing a revenue outlook for FY20." "[T]he content play in FY '21 is probably significantly larger [than 2020]. Amplifier penetration into Android is "just getting started, so prior to last year, it was essentially 0." Last year amplifier wins were base hits, but in 2020, wins are more than base hits. Remembering the product growth order, it is first "amplifiers,... headsets, and then continued success with the smart codec product line in its various forms and penetration of mid-tier and broader penetration in Android, ... further out than that is voice biometrics and microphones." From the March 2018 Shareholder letter, "Growth is expected to be fueled by broadening our penetration of the Android smartphone market through sales of products shipping today in flagship and mid‐tier ($200-$500/device) devices and a strong pipeline of design wins that should be introduced over the next 12 months." This specific product was introduced a few months ago, "Cirrus Logic Introduces Industry’s Smallest, Low-Power Boosted Smart Audio Amplifier to Support Global Shift to Mobile Stereo." Although the latest presentation brackets amplifier values between $0.45-0.75, we value the ASP of the new 55 nm amplifier at $0.60. This product is loaded with enabling features including: Cirrus' SoundClear, DC-DC convertor and others. Susquehanna analyst, believes that Cirrus could win up to 400 million amplifies with Samsung alone. 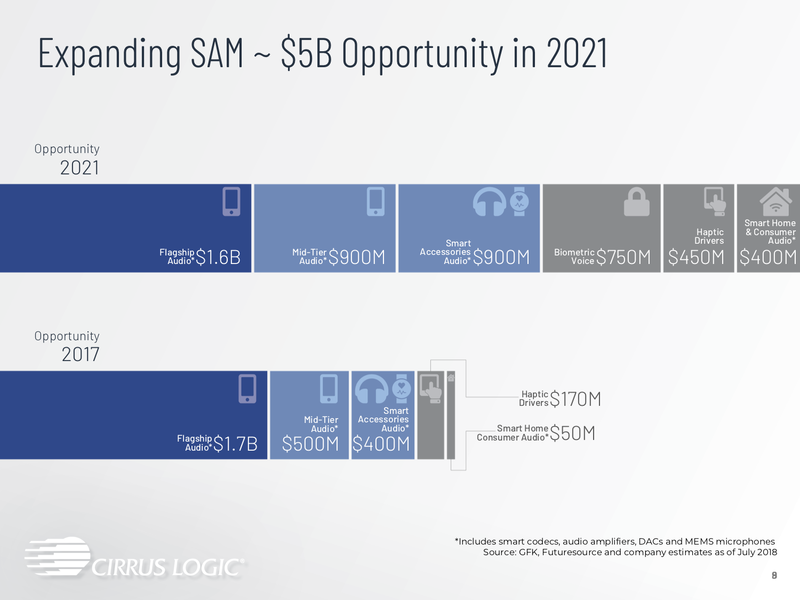 "We estimate that amplifiers at Samsung represent an ~$200 million opportunity (400 million amplifiers at $0.50 each), which is currently largely untapped by Cirrus." Changes in smartphone form factors, full dimension displays, frame orientation (5G) and quality are driving changes in haptics devices from mechanical to digital. In the spring of 2018, Cirrus introduced a new always-on version of its haptics chip. In the December quarter Shareholder Letter the company added, "With solid design wins and customer engagements, we anticipate several of these applications utilizing our haptic technology to be introduced this year." Haptics' ASPs range between $0.50-0.75. In March last year, Cirrus' Shareholder Letter commented, "While we continue to focus on diversifying our customer base, we are excited to be enabling continuously adaptive ANC in retail headsets with the two largest smartphone OEMs in the world." In the December Shareholder Letter, an additional note continued, "That said, with a wide range of products on the market today and more expected to be introduced over the next 3 to 12 months, with particular emphasis on those products with differentiated feature sets that have the potential to ship in volume, we continue to be confident about our design opportunities in this market going forward." The last conference call in January outlined coming opportunities, but discounted any needle-moving design wins for 2019. The company is in the process of negotiating with high-level customer managers for adding this functionality into coming smartphones. Remember: Apple (AAPL) is excluded from this comment. Probably the significant recent development is that the company made no mention about microphones in the last conference call, yet posted up to eight openings a few of which were targeted at seeking and locking in new business with Tier one customers. Cirrus seems to be closing in on the quality needed to heavily market this product line. We offer our thoughts concerning company, timing and product inclusions with Samsung, China OEMs and Apple. A recent teardown for Samsung's (OTC:SSNLF) new premium phones, the Galaxy 10, included two Cirrus Logic amplifiers valued at $1.20. Excluded from the phone are haptics and headset. Cirrus is moving amplifier wins forward with Samsung. In time, we are expecting that to expand into a minor headset win and haptics. Finally, in the more distant future, microphones. Our revenue summary is listed in the following table. * - Includes the Galaxy Note released in the fall. ** - Difference between 400 million minus Galaxy amplifiers. *** - $2.00 w/o mics; $4.00 w/ mics. ANC requires six mics. **** - 2 premium mics. ***** - average 1.5 premium mics. With respect to China, Cirrus has won significant amplifier and haptics sockets. Adding comments about China's business in the January call, Rhode said, "So for us, it just looks like the business. And in some other cases, they're significantly outperforming the forecast that we had in mind. So we're pretty excited about that in China..."
We continue to expect little if any business from Xiaomi (XI), China's second largest OEM. But we do expect Cirrus will gain significant market share if not all for amplifiers and haptics with the other major OEMs, Huawei, OPPO and Vivo. Between the three, approximately 400-450 million units a year are sold. Cirrus might target 60% with an average 1.75 amplifiers and 1 haptic device per unit. The table below summarizes our revenue estimates with ballpark timing. Cirrus has consistently stated that many opportunities exist to improve its ASP with Apple. Between voice biometrics, microphones, active noise cancelation (ANC) and something new, Cirrus' Apple ASP will likely increase significantly in the next 2-4 years. Craig-Hallum, explaining its downgrade of Cirrus Logic, added that Cirrus "could see a meaningful content increase with a voice biometrics chip win with a possible incremental $2 per phone." iPhones also contain four or more mics. At least one major customer is driving Cirrus' long battle in creating more perfect microphone products. If it isn't Apple, who is it? Why else would Cirrus continue this long drawn-out process? In the last conference, Rhode added this about Apple, "We generally tend, when we launch new devices, to focus on lead customers. I'll put the usual caveat in there that if we're talking about it on an earnings call long before the product is available on retail shelves, then it is clearly not for our largest customer because we don't talk about stuff for them ahead of time. That is not to say that we wouldn't or aren't working on something similar to whatever we talk about on the earnings call, but just be mindful of that." The following table lists possible combinations for future iPhone ASP. With respect to the new technology sampling, we simply guessed. Past experience suggests that Cirrus is attacking premium applications at a minimum of $1.50. It is usually higher. We can't fathom new product development that didn't come without a major customer request for a solution, Apple. In the past, Cirrus' major developments begin while helping customers solve problems. The bottom line: Cirrus is working toward doubling its ASP with Apple over the next 4 years. Revenue at 200 million iPhones a year adds $1.0 billion. Cirrus Logic's broadening vectors aren't small reaching toward an additional $2.0+ billion/yr. in coming years. So what should investors do? Buy Cirrus in the middle $40s or wait. Analysts have suggested that Apple will sell fewer phones for at least the next 5 quarters. The March and June quarter revenue isn't expected to be stellar even with the new amplifier wins beginning last quarter. But before you dismiss Cirrus, look at Advanced Micro Devices (AMD). It is expected to earn $0.50-$0.70 trading at $28. WHY? It is about the future, a bright one for AMD. Although we do expect a price correction with May's report, honestly we don't know. The growth phase began. Apple's unit sales will likely continue weak or even weaker. We are waiting to buy significantly out of the money calls, January 2022, when they appear sometime in November. We hope our approach in this article sheds further light on Cirrus Logic's strong potential with its respective timing. A few quarters ago, Cirrus included a slide, shown below, in its presentation which contains the market sizes for its coming and existing businesses. Our estimates sized voice biometrics at $500 million. Cirrus' slide estimates $750 million. Smart Home is estimated at $400 million; we added nothing. Targeted headset revenue shows $900 million; we included only $300. Our estimated revenue excludes $1.25 billion from Cirrus' targeted sizes. We believe that our estimates are somewhat conservative, at least we hope so. Disclosure: I am/we are long CRUS. I wrote this article myself, and it expresses my own opinions. I am not receiving compensation for it (other than from Seeking Alpha). I have no business relationship with any company whose stock is mentioned in this article.